Speed adjustments: 254 levels of speed adjustment controls. Temperature Compnesation: Advanced temperature compensation algorithm to adjust the position of the focuser as the temperature changes. An external temperature probe can be used to record the temperature. Stepping Controls: Control the motor stepping mode and wiring phase. Sync: Set the focuser position to any arbitary values to reset the position to the desired value. Speed: Set stepper motor speed. Lower is slower. Timer: Moves the focuser in the set focus direction for this many milliseconds. Do not use directly. Absolute Position: Set the absolute position. Max Position: Define an arbitrary maximum travel position. Any GOTOs beyond this position are rejected. Sync: Set the current absolute position to this value. It is recommended when using the focuser for the first time to fully retract the focuser (focuser is closest to the OTA) and then Sync to zero as zero is defined as the fully retracted position. Temperature: read out of the built in temperature sensor or the external temperature probe if any. Temperature: If temperature probe is connected, the current temperature in Celcius shall be reported. 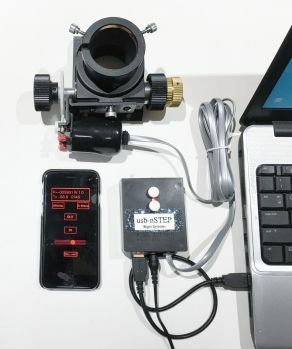 The focuser can connected to the PC/StellarMate via either a serial-USB connection or WiFi. Use Serial to USB adapter and connect it to a USB port. By default, the driver would try to connect to all available systems ports until a successful connection is made. It is genereally recommend to employ the Serial Port Assistant tool to assign a permenant designation for the port. This would make connecting to the serial port reliable from the first time if there are multiple serial to usb devices being used at the same time by the system. For WiFi nStep controllers, click on Ethernet button to switch to Networked connection. Refer to nStep documentation for configure the WiFi option. The IP address and port of the WiFi adapter is required to make the connection. After making changes to the connection parameters, go to the Options tab and save the configuration. Coil After Move: Set whether the stepper coils should be energized or de-energized after motion is complete. Caution: When set to energized, watch the stepper motor temperature as it might get warm. Change the nStep temperature compensation settings. By default, the controller boots up with the temperature compensation disabled. If you switch configuration to Auto and then save INDI driver configuration, this setting will be applied the next time you use the driver. Mode: Click One Shot to execute temperature compensation once. However, before activating One Shot mode, press Prime For Manual< first. When set to Auto, the controller algorithm shall decide when to make the temperature compensation adjustments as per the settings. Delta T.: This is the temperature change x10 to trigger a compensation. The nSTEP uses a fixed point value here which is 10X the real temperature change desired. Examples: -005 = move in "-" direction when temp changes by 0.5C, +015 = +1.5C change must be detected before triggering a compensation. The values can range from -100 (-10.0C) to +100(+10.0C) in increments of 5(0.5C). Averaged Time: Temperature will be averaged over this number of seconds. Range 1 to 75 seconds. Set to a lower value for more immediate changes. A lower value may cause 'hunting' if the sensor is detecting a value that is just toggling slightly (e.g. from 17.5C to 18.0C to 17.5C). Controls the stepping mode and phase. Half: Energizes 1 or two coils at a time, doubling step resolution. Full: Highest power mode, two coils always energized. Phase Select: set to 0 for usb-nSTEP. Can be used for any possible the phase wirings. Allow a person to wire the phases in any order then chose one of 3 settings in software to drive them.